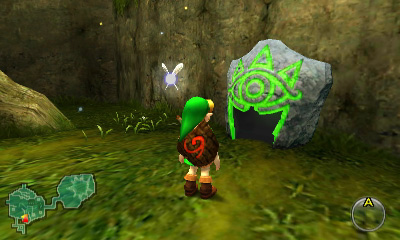 Nintendo’s European Zelda: Ocarina of Time 3D portal reports that there are only two of the Visions hint system Sheikah Stones contained in the entire game. I can confirm this based on my own hands-on experience with the game so far. It’s an interesting development, given how pervasive the hint systems and Super Guides of New Super Mario Bros. Wii, Super Mario Galaxy 2, and Donkey Kong Country Returns were by comparison. I’m hopeful that, should there be a similar hint system in Skyward Sword, it will be equally sparse in its implementation.